A central team wants to know if Sri Lankan Tamils want to return to their country. Rediff.com's A Ganesh Nadar reports from the Mandapam refugee camp. A two-member central team visited the refugee camp in Mandapam, Ramanathapuram district, Tamil Nadu, to find out if the Sri Lankan Tamils want to go back to their country nine years after the civil war that devastated the island-nation ended. The Mandapam camp, which houses 850 refugees, is the receiving camp for those coming from Sri Lanka before being sent to other camps in Tamil Nadu. A notification said the objective behind the central team's visit was 'to know about the facilities being given to the refugees, and their wishes and requirements to go back to their country'. The central team comprised Prasanthajith Dev, director for refugee rehabilitation at the home ministry, and Satheesh Kumar, secretary for rehabilitation, apart from Tamil Nadu government officials. "They did not meet all of us, but met only those who wanted to meet them," one Sri Lankan Tamil refugee tells me. "They asked about the facilities here and we said we are happy." "Most of us are happy here and don't want to go back. Some want to go back and they informed the central team that they are willing to go back." "I have been here for 20 years now, I don't know what awaits us there (in Sri Lanka)," confides a Sri Lankan Tamil who wants to go home. "I want to take all my things as setting up house is not easy," the man adds. "They should start a ferry service so we can take our things. By air we can only take our clothes. In that case I will have to leave everything here or sell it at a throwaway price." A ferry service from Tuticorin to Sri Lanka was launched in June 2011, but it was shut down five months later by then chief minister J Jayalalithaa citing security concerns. "OfERR (Organisation for Eelam Refugees Rehabilitation which works among the refugees) volunteers are canvassing the refugees to go back, but everyone is not willing to," adds a third Sri Lankan Tamil. "My mother came here with me and my sister 25 years ago after we lost our father in Sri Lanka," a young woman tells me. "All my life I have been here, so I don't want to go back ever," she declares. "My sister is married to another Lankan Tamil. I also want to get married and settle down here." 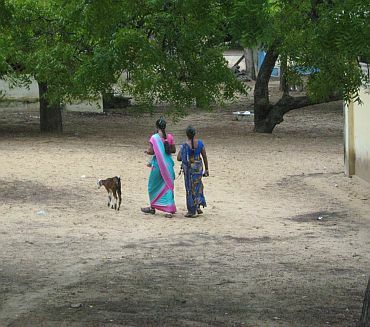 Over 100,000 Sri Lankan Tamil refugees are spread across Tamil Nadu, with at least one camp in each district. These Sri Lankan Tamils live under the watchful eye of the Tamil Nadu police's 'Q' branch, which is why none of those I speak to reveal their names. Since these Sri Lankan Tamils have lived in India for many years, some observers feel they should be granted Indian citizenship. Maintaining the refugee camps and sustaining the refugees, they feel, is an unnecessary burden on the government.